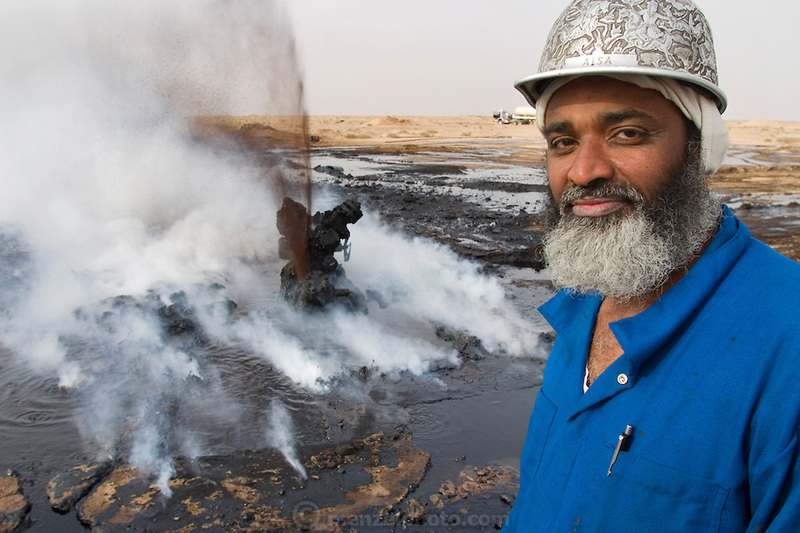 Aisa Bou Yabes, head of the Kuwait Oil Company firefighting team dispatched to southern Iraq smiles ever so slightly after his team extinguished their first oil well fire in Iraq's Rumaila field. The wells were set on fire with explosives by retreating Iraqi troops when the US and UK invasion began. Seven or eight wells were set ablaze. Here the ground is still smoking and oil boiling as the well still spurts some oil. The Rumaila field is one of Iraq's biggest oil fields with five billion barrels in reserve. The burning wells in the Rumaila Field were ignited by retreating Iraqi troops when the US and UK invasion began in March 2003. Rumaila is also spelled Rumeilah.